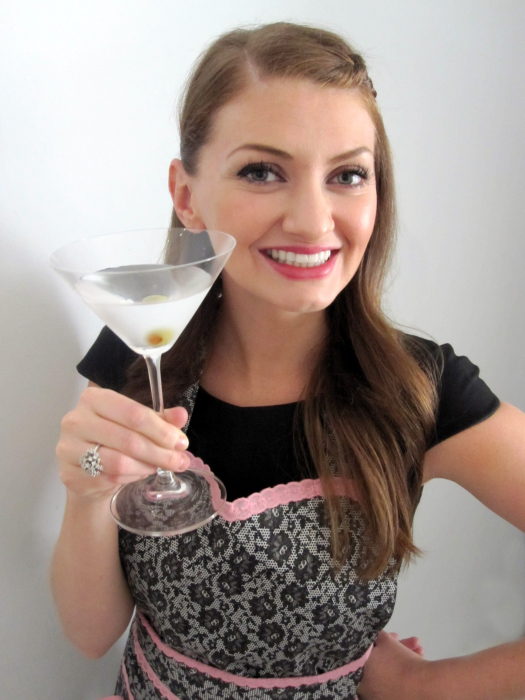 today, i’m participating in a fun blogger event — the secret recipe club. how does it work? every blogger is secretly assigned another blog + chooses a recipe from that blog to make. on reveal day (today! ), all of our posts go up at the same time, + everyone gets to see who was assigned to their blog, which recipe they chose, + how it turned out. fun, huh? this month, i was assigned Casey’s blog Beautiful Disasters, a fantastic blog full of delicious-looking food. 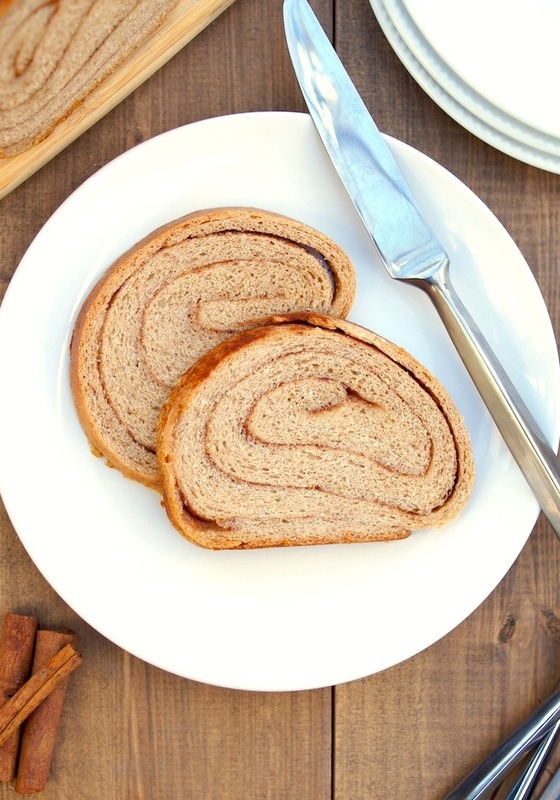 while tons of recipes stood out as potentials to try, one looked + sounded particularly irresistible – whole wheat cinnamon swirl bread. i grew up eating pepperidge farm cinnamon raisin bread + Casey’s version reminded me how much I used to love it. so, i decided to give hers a try! so, how did it turn out? truly wonderful! the house smelled absolutely scrumptious while it baked + i could barely wait to slice into it. i served it toasted + topped with a generous slathering of butter + sweet fancy moses, it was amazing! since it uses whole wheat flour, it has some healthy perks, offering more protein, iron + fiber than if you only used white flour. food that’s good for you *AND* tastes great? always a favorite of mine. 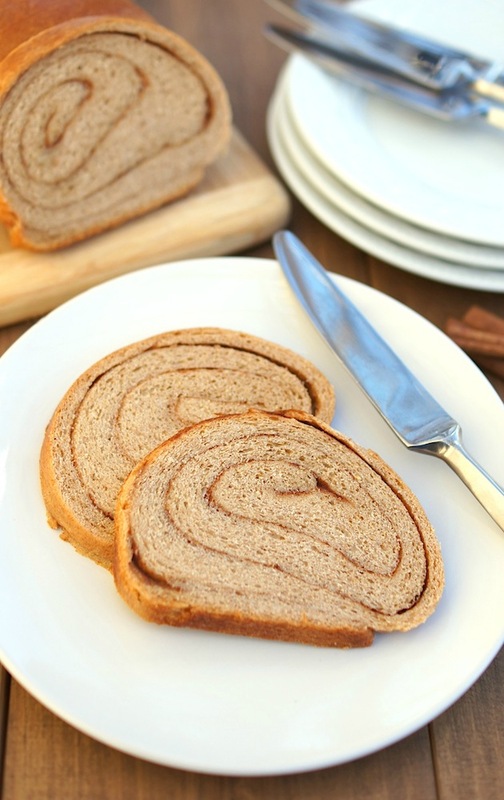 thank you to Casey for introducing me to this delicious bread, + to the secret recipe club for connecting me, yet again, with fantastic bloggers + amazing recipes! combine warm milk, water, yeast, + 2 teaspoons sugar in a measuring cup + let sit for 10 minutes until foamy. the temperature of the milk/ water should be warm but NOT scorching hot. while the yeast is resting, combine the flour, 1/3 cup sugar, 3 tablespoons softened butter, salt, + 1 tablespoon cinnamon in the bowl of a stand mixer. using the paddle attachment, start to mix on slow. then, drizzle in the water/milk mixture while the machine is running, until the mixture just starts to come together. spray a large bowl with cooking spray + place the dough ball in it. cover with a cloth + let rise for 1.5 hours in the warmest spot of the house. while the dough is rising, mix together the remaining 3 tablespoons butter with the extra 1 1/2 teaspoons cinnamon + 1 tablespoon sugar in a small bowl until smooth. after the dough has risen to double its size (about 1.5 hours), roll out on a floured surface to about an 1/8th inch thickness into a long rectangle. smear the butter mixture over the top of the rectangle + roll up tightly. place the rolled dough in a greased loaf pan, cover with a cloth + let rise an additional hour in a warm spot. preheat oven to 350 degrees F. whisk together the egg + 2 tablespoons warm water + brush all over loaf. bake for 40 minutes or until golden-brown on top. let cool + slice. I haven’t, but I’ve heard great things about it – I need to start working with it! This comment is so late (SO SORRY!) but better late than never Your bread looks like it turned out awesome!! Beautiful pictures, thank you so much for the kind post. I’m happy you enjoyed the bread, it is one of my favorites. You have a beautiful blog!